Sales teams in Fairfax Media's Australian Community Media business are now better informed, thanks to a new AI-driven intelligence platform. Insights and business analyst Robert Tidball says the division's 600 sales people, admin, and managers had previously relied on limited audience information for its 200 news brands and a further 100 they represent. "Providing sales collateral based on research has historically been a difficult task," he says in an INMA post. Audience metrics for print from Ipsos (through Emma), digital metrics by Nielsen or Google Analytics, and demographic metrics from census data were previously provided by a single analyst and often distributed on a limited ad hoc basis by email. "The remaining sales reps did not receive data-driven sales collateral," he says. A self-service business intelligence platform can now be used as a "single source of truth" for audience data by the entire business unit. Users can select the title they are representing and view audience buying preferences for more than 50 different industries and 350 Australian brands. With the data available for 200 newspapers and websites or packages, more than 200,000 different combinations of brands/industries and newspapers and sites are possible. "Each page is designed to be a stand-alone sales argument and the data is accompanied by natural language generation (NLG) insights, which aid the salesperson in explaining the research to the client," says Tidball. "This NLG functionality was built in during the extract, transform and load (ETL) process before being loaded into BigQuery." The platform is online and can be accessed through a link. Users access the platform through a link through Fairfax's Facebook Workplace social media platform, uptake of which was "viral" as early adopters shared the link with co-workers. "Feedback from salespeople indicates that insights from the platform have contributed directly to generating new revenue," he says. "Additionally, they now have more time to sell rather than searching for information. "The business has benefitted from the existence of a single source of truth, as the data is always accurate and always up-to-date," he says. 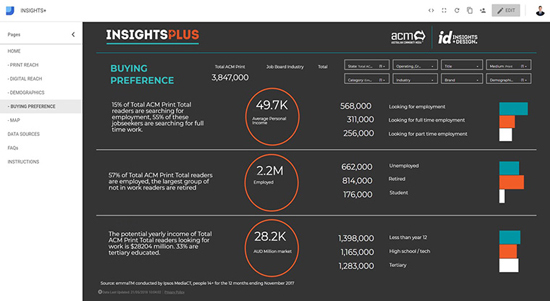 Business units outside of sales are now using the platform, which has been quoted by ACM journalists, and Tidball says it has also been an international awards winner.